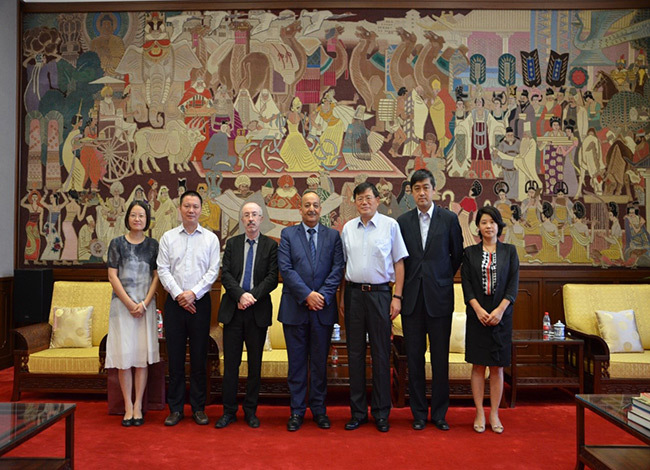 Han Yongjin, Director of the National Library of China (NLC), met with the Minister of Culture and Information of Morocco, Mohamed Laaraj, on August 24 afternoon. He congratulated Morocco as the guest of honor in the 2018 Beijing International Book Fair. Han Yongjin briefed Mohamed Laaraj about the NLC, the establishment of the "The Silk Road International Library Association” and the “Arab-China Digital Library” project. He also extended invitation to the national library of Morocco in joining the "The Silk Road International Library Association" to give full play to its influence and promote the development of the alliance. Mohamed Laaraj expressed his thanks for the warm reception of NLC. He hoped the national libraries of the two countries should strengthen exchanges and make long-term cooperation in the fields of document digitization, making the best of their technical advantages respectively. After the meeting, the delegation also visited the National Museum of Classic Books and the North Area of the Library.